âEclectic Entertainingâ links with your smart phone or tablet via QR codes at the end of each chapter; readers can easily scan and access the grocery list (organized by supermarket section) to eliminate the need for a hand-written list. EDWARDS — Author Barbara Stafford will be signing copies of her book “Eclectic Entertaining” at Kitchen Collage in The Riverwalk at Edwards on Saturday. 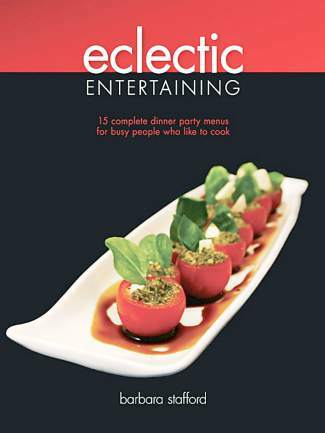 “Eclectic Entertaining” is a new and uniquely styled cookbook intended to resurrect the lost art of entertaining. The book contains 15 complete dinner party menus to choose from — each with appetizers, sides, salad, a main course and dessert — with a complete grocery list for each menu. The event runs from 11 a.m. to 2 p.m., and an easy appetizer and dessert from her cookbook will be sampled. The book is superbly organized to save the host or hostess some time and energy when planning, shopping and cooking, and it uses 21st century technology, as well ­— “Eclectic Entertaining” links with your smartphone or tablet via QR codes at the end of each chapter. Easily scan and access the grocery list (organized by supermarket section) to eliminate the need for a hand-written list. If you like one or two items in the book but aren’t cooking for an entire dinner party, easily touch any individual menu item and get the grocery list for that specific dish. Stafford is a Colorado resident and loves skiing at Vail and Beaver Creek. Books retail for $30 and are available at http://www.eclectic-entertaining.com, at Kitchen Collage and in other select retail locations.